The Blueberry3D tools for construction and viewing terrain are an exciting new development in terrain visualization software. No demo of the construction software is currently available, but i downloaded the viewer demo (27MB, no longer online) and evaluated it. The demo installs and runs very easily. There is one supplied scene, a large island with numerous features and a great deal of vegetation. You do not interact with or change the scene, other than by navigating or driving a vehicle over the terrain. It does not appear to be a real-world location, but a well-designed artificial scene. Performance is controlled by setting a framerate target (default 20 fps), with the LOD of the culture and ground textures adjusted continuously to meet the target. The vegetation. A very large number of plants are rendered, greater than in any other title to date. There are around 4-6 different species, and they are drawn either as billboards at a distance, or low-poly models when close. Shadows. The culture (buildings, walls, streetlights, vehicle) cast shadows onto the terrain and onto each other. Although seen in current commercial game titles, it is nonetheless well implemented. The roads are very smoothly modelled with cut-and-fill operations embedded into the terrain. making the building behind them vanish. The LOD popping and morphing was extremely visually distracting. For vegetation, especially at ground level, large patches of bushes would suddenly flicker into existing from nothing. In most cases, the billboard representation was so different from the polygonal model for each plant, that it appeared the entire plant was gradually disappearing and being replaced by an entirely different plant. The alpha-morphing technique used also caused problem with other objects in the scene. For the ground texture, the process of successive levels of detail was obvious and involved lots of flashing, flickering and color shifting. At some times, the ground mesh even exhibited cracks. 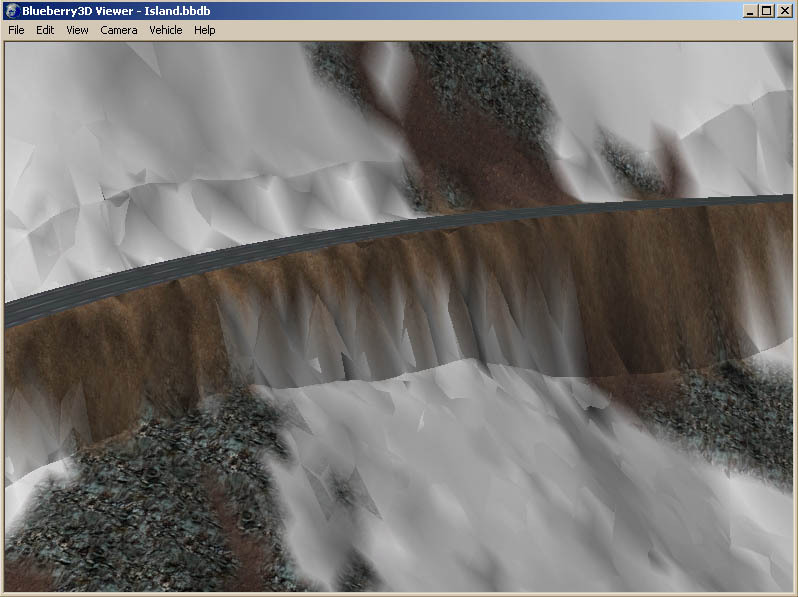 The heightfield LOD caused the edges of water surfaces to move unrealistically. 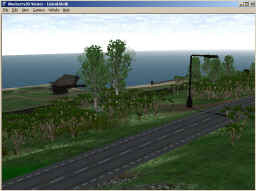 LOD problems with both the vegetation and ground were much less noticeable when the viewpoint was at a higher elevation, e.g. > 100m. 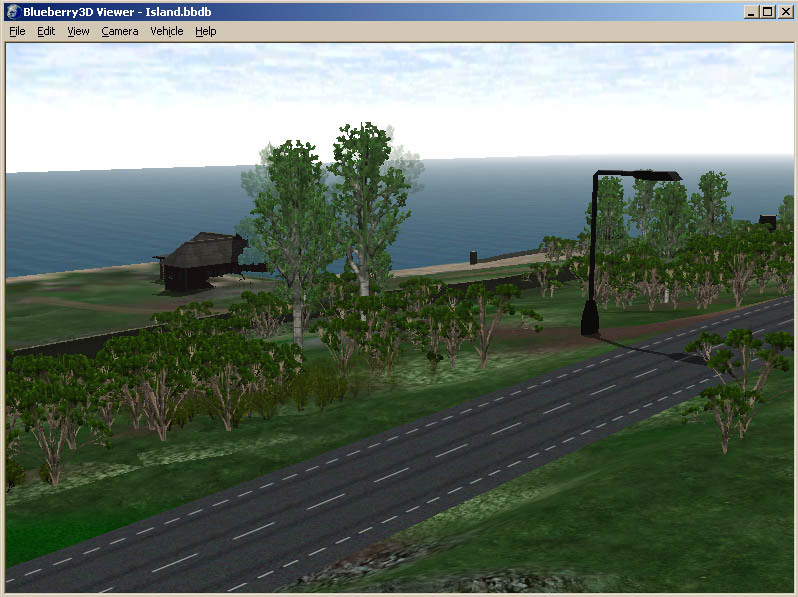 Lighting of the terrain was highly discontinuous around the road "skirts", looking quite artificial. The Blueberry3D viewer represents some important steps forward, but is currently held back by the highly visually distracting nature of the LOD while the viewpoint is moving. It might be appropriate for some applications in which the viewpoint seldom moves or remains at a relatively high elevation. An important test would be to next evaluate the Blueberry3D creation software, since in many ways creation is a more challenging task than rendering, and a viewer is only as useful as the worlds than can be created for it. The excellent distribution of vegetation in the demo scene indicates an exciting degree of sophistication in the scene creation process.